Shukria Barakzai, founder and editor of Kabul’s Aina-E-Zan (Women’s Mirror), a newspaper for Afghan women, was named Worldpress.org’s 2004 International Editor of the Year. Worldpress.org presents this award each year to an editor or editors outside the United States in recognition of enterprise, courage, and leadership in advancing the freedom and responsibility of the press, enhancing human rights, and fostering excellence in journalism. Mrs. Barakzai answered questions from Worldpress.org about the state of the media in Afghanistan, heading secret schools for girls during the reign of the Taliban, and the joys of voting alongside 3 million Afghan women. You began Aina-E-Zan (Women’s Mirror) in 2002 as a weekly newspaper aimed at Afghan women. What drew you to journalism and how has the publication been received by both female and male readers? What are your goals for the future of Women’s Mirror? Shukria Barakzai: Two thousand two was a splendid year for Afghan women, a year begun with the formation of the interim administration. Vast international attention was then paid to war-ravaged Afghanistan. I personally wanted to celebrate this year of change. I wanted to rejoice in the advent of 2002 with a message of freedom and solidarity to my fellow Afghan women. I shared my wish of establishing a newspaper aimed solely at women with my colleagues and friends, who warmly supported my efforts. The newspaper was conceived with the idea that women may communicate and learn through our shared experiences and our common suffering, and through this communication derive strength and appreciation. It was Feb. 2, 2002, when the first issue of Women’s Mirror was distributed in Kabul and four nearby provinces. Women’s Mirror has been received much better than our expectations. As the country becomes more pacified, we receive more and more requests for Women’s Mirror throughout Afghanistan. Three years later, our goals, commitments, and principles remain largely the same: the development of Afghan women. Women’s Mirror covers recent news and developments in education, health-care, media, and civil society. It seeks to improve the understanding and knowledge of Afghan women so that they may be better-informed citizens. Domestic violence, economic hardship, and security instability remain daunting problems. What do you feel are the most pressing issues faced by Afghan women today? The most visible challenges for Afghan women today are taking an active part in the rebuilding of the institutions of a modern civil society; expanding our political, social, and economic participation in the community; fighting stifling superstitions and traditions; terminating illiteracy and ignorance; and broadening international understandings of human rights. In addition, women must struggle to increase their participation at upcoming parliamentary elections and give voice to the reformative agenda. It is hard to speculate on the scale of difference in Afghan women’s lives in the last three years — particularly in terms of public life. The changes have been so vast and sweeping — and the oppression suffered previously so terrible — that any improvements seem to be victories. But we cannot allow ten years of demagogy and oppression to be the sole scale by which we judge progress or the character of Afghan women today. Centuries ago, we had strong women in every part of our community. Women have always held prominent positions in our history. It is also illogical to say that every problem has been solved and that Afghan women are relieved from all the miseries they have suffered. There remains a long and difficult path of showing each Afghan how to recognize and protect the values of the liberty he or she possesses. Voter turnout exceeded expectations in the October 2004 elections. What role did the Afghan media have in the course of the campaign? What is the state of public political debate? Afghans have suffered decades of fratricidal war, terrorism, and bloodshed. We have lost schools, hospitals, roads, universities, and an educated and well-informed populace. The revival of democracy in this war-ravaged country — among citizens who still suffer daily from poverty, illiteracy, and other hardships — gives hope not only to victims of oppression around the world, but to the Afghans themselves as they work to sustain this powerful project of liberty. Although many civil institutions were demolished owing to the two decades of merciless war Afghanistan has witnessed, the free media is at the point of rehabilitation. Media played a significant role during the October 2004 presidential election in Afghanistan. There were 18 presidential candidates with more than ten million eligible voters, all of whom showed extraordinary, active participation during the campaigning and voting periods. The ongoing political debate in Afghanistan concentrates on upcoming parliamentary elections. In addition, the agenda pursued by President Hamid Karzai is another hot issue. Disarming, demobilizing and reintegrating tens of thousands of militia forces, extending the central authority into all 34 provinces, fighting and terminating the cultivation and smuggling of drugs, and privatizing the economy are the most controversial and pressing political themes in today’s Afghanistan. Women’s participation in the vote, while not uniform across the country, was still high. A woman candidate even stood for election as president, and came in sixth in a field of 18. What impact did this turnout and candidacy have on the election and the issues at stake? Of the more than 8.1 million voters who participated in the October 2004 elections, more than 3 million were female voters. This may initially seem imbalanced, but one who is familiar with Afghanistan will indeed regard it a tremendous change in this traditional and war-devastated community. The latest National Human Development Report produced by the United Nations Development Programme shows only 17 percent of Afghan women are literate. Thus, the turnout of female voters for the presidential election is a victory and a sign of hope for radical changes in Afghanistan. 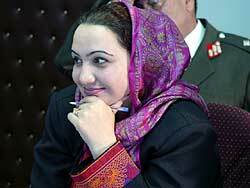 What do you feel is Afghanistan’s postelection scenario in terms of women’s rights and freedom of the press? I am confident that Afghan women are the humblest creatures of the 21st century — women still regarded as second-class humans, yet daily striving to improve their place in society. They deserve the respect and support of women everywhere. Our elected president has formed a 26-member cabinet. Only 3 women are members and have been given rather symbolic positions: heads of the Ministry of Women’s Affairs, the Ministry of Martyrs and Disabled, and the Ministry of Youth Affairs. Unfortunately, the post election scenario seems not to be in favor of women in Afghanistan. Women’s development issues have largely been put aside. The international community seems to be busy with Iraq, the Middle East, and reviving relations between U.S. and Europe. Fortunately, our own media have kept pace with the emerging civil society and there are growing numbers of text, audio, and visual media in post-conflict Afghanistan. What impact does last year’s record poppy production have on women in Afghanistan? According to the latest annual report from the United Nations Office of Drugs and Crime, Afghanistan produces 75 percent of the world’s illicit opium. Poppy cultivation and smuggling are rooted deeply in Afghan society. Women are often victims of atrocities resulting from the illicit drug trade. In many cases, young girls are direct victims of the drug trade, being forced into early marriages or used as collateral for compensation in drug transactions. During the Taliban era, you headed several underground schools for women and girls. What obstacles do women and girls face today in the pursuit of education in Afghanistan? Poor infrastructure is a huge obstacle to the pursuit of education in Afghanistan. In most provinces, the majority of people still do not have access to safe drinking water, electricity, or health facilities. Schooling in Afghanistan is a sign of wealth and prosperity. Many parents want their female children to attend school but poverty, harsh traditions, security concerns, and lack of schools are several of the many obstacles barring girls from entering formal schools. Against all these obstacles, Afghanistan is a proud country where more than 5 million boys and girls are enrolled in schools. According to the U.N.’s National Human Development Report for Afghanistan, the enrollment rate of children is higher than that of neighboring Pakistan. This is indeed good news, but much progress still needs to be made. I think if we broaden the reforms and accelerate the rebuilding process, more and more female children will attend school. You were recently a member of Afghanistan’s Constitutional Reviewing Commission. In January 2004, the new Constitution granted equal rights and responsibilities before the law to both men and women. How does the average Afghan woman experience this development? Our modern Constitution was approved by 500 delegates from around the country in January 2004 in Kabul. It is perhaps Afghanistan’s most valuable and impressive achievement in the past three years. The Constitution gives women many opportunities to represent themselves equally before the law. Months after the approval of our Constitution, for the first time in our modern history, a woman emerged as a candidate for the presidential post — a right given to her by the Constitution. The ongoing reforms and democratizing agenda in Afghanistan owe their existence to the rich articles of the Constitution.